Originally disguised as Hank Henshaw, the head of the Department of Extranormal Operations, J'onn J'onzz is actually a green Martian, one of the last of his kind. He has taken on a mission to help Supergirl protect Earth from threats both human and extraterrestrial. A shapeshifter, J'onn can look human, but when he goes into battle he takes on his true form and fights for justice as the Martian Manhunter. 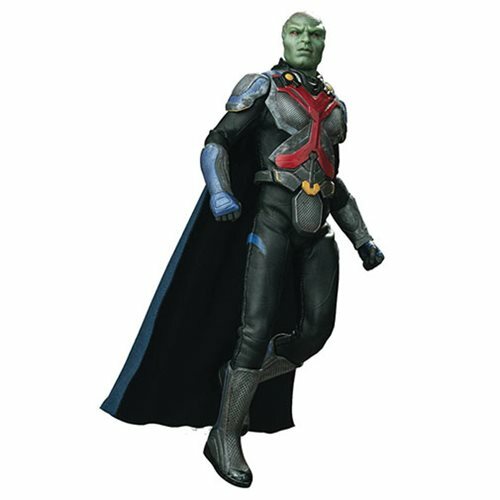 This 1:8 scale Real Master Series action figure features an authentic likeness of the Martian Manhunter from the CW series, Supergirl. He has two different heads, one with a calm expression and another with a fighting grimace. He's featured in his Martian battle suit with cape! This Supergirl TV Martian Manhunter 1:8 Scale Action Figure comes with 2 extra sets of hands.